Owning a home provides many benefits and advantages for those who achieve it, but the burden of maintaining, repairing and replacing home appliances goes right along with it. 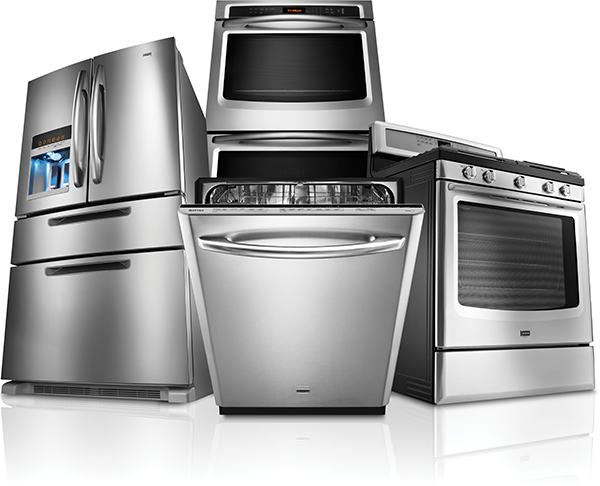 The decision to repair or replace a broken or failing appliance is often made under pressure and without adequate knowledge or information about the nature of the appliance or its expected lifetime. Many repairs for refrigerators are easy and affordable to fix, especially if the problem is a bad motor, a refrigerant leak, or electronic controls. Door seals can fail, causing this appliance to run overtime or build frost in the freezer section. Between the cost of replacement door seals and the labor to install them, it often makes sense to replace the refrigerator instead of repairing it. Water leaks and broken belts are common problems associated with washing machines and easy to repair. A burned out motor may prompt a replacement, depending on the washer’s age and condition. Clothes dryers create a good deal of heat, and when they malfunction, it can be dangerous if their safety switches malfunction. A dryer that overheats clothing is a fire hazard, and unless the breakdown results from a failed motor or timer, it’s probably a good idea to consider replacing it.